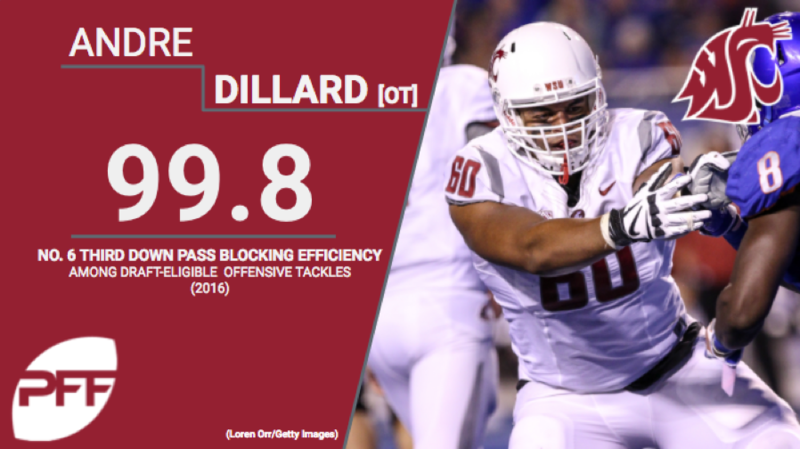 Washington State redshirt junior T Andre Dillard kept his quarterback Luke Falk clean with great consistency, especially on third downs. Dillard ranked No. 6 in the 2018 draft class in pass blocking efficiency (99.8 percent) on third downs. Dillard’s 91.4 pass blocking grade ranked No. 2 only second to his teammate Cole Madison among all returning FBS offensive tackles in 2016. Dillard ranked No. 5 in overall grade (89.2) among that same group of offensive tackles. Despite his obvious successes in pass protection, Dillard wasn’t able to perform at a similar level in the run game. He ranked No. 30 in the 2018 draft class in run block success percentage.